Delish. Now that’s a colour that sings to me on a winters day. More beetroot in the veg box, so scrubbed them all and bunged them in the oven. Easy. Then made this simple curry. If you can’t get the curry leaves, don’t worry as you can make this without and it will still be brilliantly tasty. The pumpkin will soften down and start to break down into the soup, which also thickens it slightly. And then I had it again……the next day (I did a separate post too). and this time I stirred in 75 ml whipping cream into each portion, added some freshly boiled eggs to the top with the crushed cashews. A rich, sweet and filling and a brilliant vegetarian dish that even a meat eater might really enjoy! 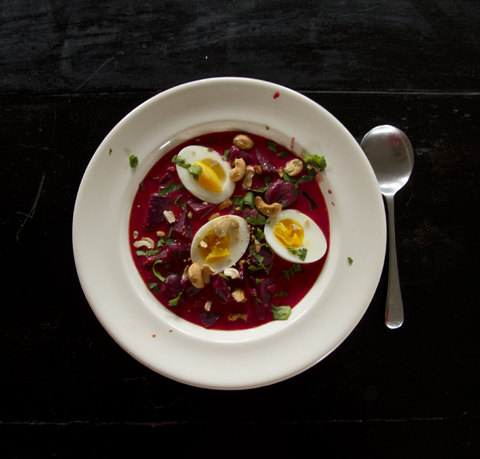 Bloody good Beetroot Coconut curry. For a veggie boost, add about 200 g chopped firm tofu or Paneer cheese, (the main supermarkets sell this Indian cheese) with the beetroot. …….and then I had it again the next day with cream and egg, (See pic above)…..I stirred 75 ml whipping cream into each portion, added some freshly boiled eggs to the top with the crushed cashews. 1. Preheat oven 200 C/180 C fan/Gas mark 6. Scrub the beetroot well and place unpeeled in a roasting tin or dish and cover with foil. Bake for 45 minutes to an hour or until tender when the centre is poked with the tip of a small knife. Set aside to cool. 2. When the beetroot are cool enough to handle, scrape off the skin with a small knife and chop into small cubes. 3. Melt butter with the curry leaves, if using, then add the crushed garlic, grated ginger, chilli, cardamons, cumin and orange zest and stir fry for about 3 minutes, then add the orange juice, tomatoes, coconut milk and stock. 4. Season, bring to a boil, add the mushrooms and chopped beetroot and bring to a boil again. Reduce heat and simmer for 5 minutes or until the mushrooms are tender. Add the chicken, if using and heat through for a few minutes. 5. Check for seasoning, squeeze in about ½ the lime or lemon juice. Taste adding more to taste. Top with a dollop of the creme fraiche or yoghurt. Crush the toasted nuts, chop the coriander and scatter both over the curry. This entry was posted in August, December, February, January, July, Lunch, Meat & Poultry, November, October, September, Soups, Supper, Vegetables, Vegetarian and tagged indian cheese. Bookmark the permalink. thanks you’ve given me the idea to add cashews to a beetroot rice dish i was pondering. Oh good! What was the pondering rice dish?! You mentioned pumpkin as a thickener…should it feature in the ingredient list? I made this curry today and loved the flavour, but it was more like a soup. Pumpkin as thickener? What do you mean? Umm? Not sure yours was more like a soup. Mine was as you see in the pics. Did the beetroot break down beyond cubes then? Like I said, the curry tasted great but there seemed to be a lot of liquid for the amount of beetroot and mushrooms in the recipe (I didn’t add any additional protein – chicken/tofu).